Hutchison Whampoa’s ports unit has set an indicative price of US$0.91 to US$1.08 per unit in a Singapore listing, aiming to raise US$4.2 billion ($5.35 billion) in addition to cornerstone investments, according to its preliminary prospectus. Capital Research will invest US$634 million in the offering, according to the term sheet. Paulson & Co., managed by John Paulson, will buy a US$350 million stake and Lone Pine Capital LCC will invest US$186 million, it said. Jenkin Hui and family, Singapore’s Temasek Holdings, Cathay Life Insurance Co. and Metropolitan Financial Services will each invest US$100 million, and Ally Holding Ltd. will buy a US$50 million stake. 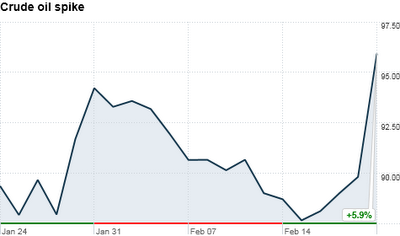 Hutchison rose 1.6% to HK$91.45 ($14.9) at 3:02 p.m. in Hong Kong trading. The company, which also invests in real estate, oil and gas, drugstores and mobile-phone services, has jumped 15% this year, outperforming the benchmark Hang Seng Index’s 1.4% gain. Hong Kong tycoon Li Ka-shing’s ports unit is looking to raise as much as $5.8 billion in its Singapore IPO, seeking to cash in on a recovery in global trade and provide investors with access to China’s booming infrastructure business. The listing, Southeast Asia’s biggest ever, comes at a time when sea-borne trade in Asia is swelling and global container shipping firms are putting more ships and resources to serve Asian routes from Europe and North America. The capital-raising could provide additional ammunition for Li, Asia’s richest man, who is looking to make a big play on UK power assets through his Cheung Kong Infrastructure (CKI) (1038.HK) unit. The deal has attracted big names including Singapore state investor Temasek Holdings (TEM.UL), U.S. hedge fund manager Paulson & Co and Cathay Life Insurance, who will be putting in US$1.6 billion as Co as cornerstone investors, according to the preliminary prospectus. The assets of the Hutchison’s subsidiary, Hutchison Port Holdings Trust, are located in Hong Kong and Shenzhen, two of the world’s busiest container ports in 2009 with a total throughput of 39.2 million twenty-foot equivalent units, the prospectus showed. It would be the first publicly traded business trust backed by port assets,according to the prospectus, and would exceed Malaysia’s Petronas Chemicals’ (PCGB.KL) US$4.1 billion listing of 2010, which has so far been the biggest listing in the region. “Given the size of HPH Trust, we expect the proposed IPO to attract significant investor interest,” said Sean Quek, Singapore head of research at Credit Suisse. Hutchison Whampoa (0013.HK), the world’s largest container terminal operator, is spinning off Hutchison Port Holdings Trust in a separate listing in Singapore to take advantage of regulations that are favourable for trust-like companies. With operations in 53 countries and approximately 220,000 employees worldwide, Hutchison has five core businesses -- ports and related services; property and hotels; retail; energy, infrastructure, investments and others; and telecommunications. The company chose Singapore over Hong Kong because the city-state has been an attractive destination for infrastructure and real estate trusts, bankers said. “It will be interesting to see how Hutch puts the money to work – does it repay debt, does it acquire utility businesses at reasonable valuations or does it venture into something as risky and expensive as 3G?," said Jacob Samuel, credit analyst at Nomura. The yield from the offering of between 5.5% to 6.5% to unit holders, is lower compared to an average of around 7% offered by Singapore-listed business and property trusts. Hutchison Port Holdings Trust reported a net profit of US$655 million in 2010, from a revenue of US$1.49 billion. Similar trusts have been lapped up by investors who seek a higher dividend yield and want to diversify from bonds. Singapore is home to property trusts owned by Southeast Asia’s biggest property firm CapitaLand (CATL.SI) as well as shipping, infrastructure and logistics’ trusts from China to Australia. Based on the maximum indicative price, the market cap of the company will be $9.4 billion after the listing, which is likely to take place on March 18, according to a source with knowledge of the deal. Hutchison Whampoa and Singapore state-owned PSA International, which owns 20% of the Hong Kong firm, will together own 32% of the company after the listing if overallotment is exercised. Paulson will invest US$350 million in the IPO, whereas a Temasek unit will put in US$100 million. DBS (DBSM.SI), Deutsche Bank (DBKGn.DE) and Goldman Sachs (GS.N) are joint bookrunners and issue managers. JPMorgan (JPM.N), UBS (UBSN.VX), Barclays (BARC.L), Morgan Stanley (MS.N) are among co-lead managers. 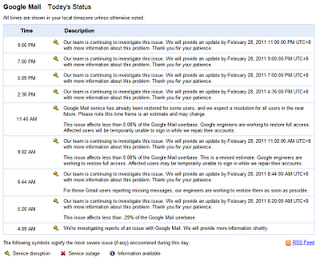 A still unknown bug in Google Gmail is seeing 150,000 or 0.08 percent of Google Mail userbase inboxes wiped out completely. Accounts that are affected are currently fully disabled. 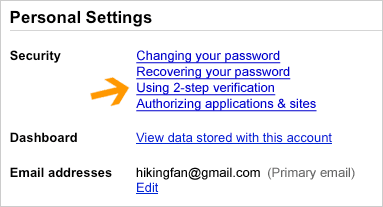 We're in the process of changing this to be a Gmail only disable so you should regain access to other Google services soon. This will also mean email to these accounts stops bouncing and gets queued up for later delivery instead. 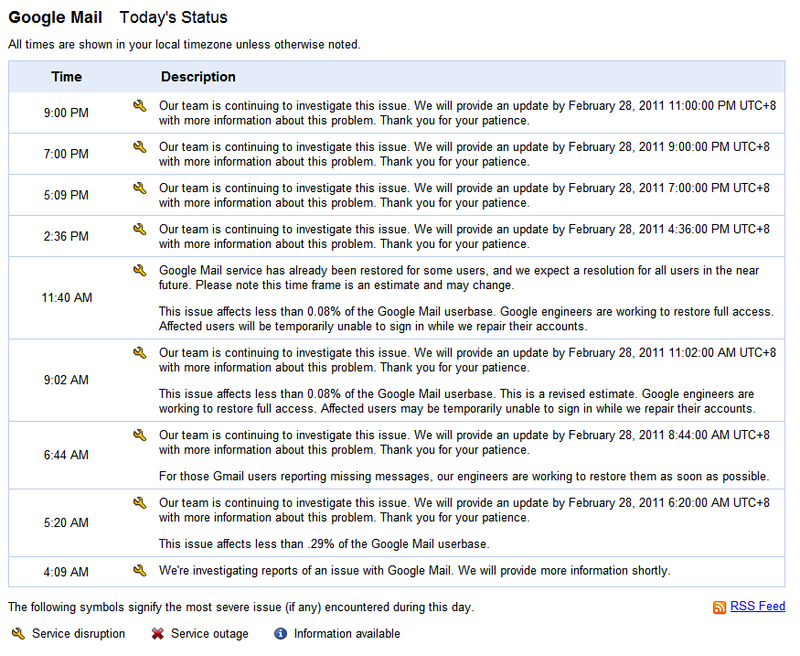 The Google Apps Status page shows Google Mail's status as being disrupted. 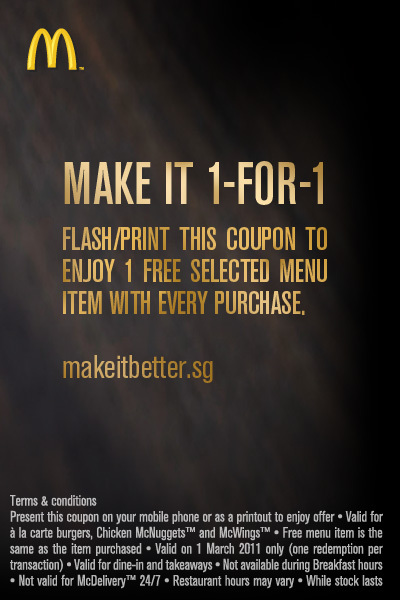 If you like Mac, print out the above coupon and get 1-for-1 on 1 Mar (tml). Only ala carte burgers, nuggets and wings. Gerrymandering is a practice of political corruption that attempts to establish a political advantage for a particular party or group by manipulating geographic boundaries to create partisan, incumbent-protected, and neutral districts. The resulting district is known as a gerrymander; however, that word can also refer to the process. Chinese Premier Wen Jiabao pledged to curb inflation and punish abuse of power in an online forum as Chinese police blanketed Beijing and Shanghai to head off planned protests inspired by revolts in the Middle East. Yes, this "copycat" non-violence style protests had spread across the Africa to Middle East, from Tunisia to Egypt, Yemen, Libya, Bahrain, Jordan, Iran and Oman. I really do hope it will not spread further and put more strain to global economy, bringing prices of necessities even higher. This article attempts to provide tutorial on how to get the footer of a GridView to be displayed as a SINGLE cell i.e. setting the ColumnSpan property to match the number of columns. The trick is to use the OnRowCreated method. e.Row.Cells(0).Text = startRec & "-" & endRec & " of " & dv.Count & " records"
Woot! All readings from my starred in Google Reader are cleared. Okay, just left those in my Gmail Starred. Amazon released a firmware 3.1 upgrade to Kindle owners that will be delivered via a Wi-Fi connection. To receive the update, please turn your wireless on and connect to an available Wi-Fi network (learn how to set up Wi-Fi on your Kindle). The software update will automatically download in the background and install when your Kindle goes into sleep mode. The update should take less than 10 minutes to complete. If a Wi-Fi connection is not available or you would prefer to transfer the update via USB, please view these instructions. For more information on these updates, follow this link. A local Singaporean professor sent an email to former NTUC Income CEO Mr Tan Kin Lian to relate the sorry plight of being local professors in Singapore. The message is originally posted here but I shall repost it here. For those who are academically inclined, one common dream is to become a university professor. For many countries in the world, this is a position worth aspiring to as professorship carries prestige and comfortable income. For Singaporeans who aspire to become professors in Singapore, it is sad to say that based on the happenings in a local university over the last few years, they found it a nightmare. In this university, many Singaporean professors have been fired when they reach the age of around 55 (much lower than the national retirement age). Many of these professors have contributed to the development of the university for more than 20 years. And to add insult to injury, many of the university management who decided to fire them are actually foreigners. When the university recruit new professors, many of them are also foreigners and some of them are in their 60s or even late 60s. As the university is heavily subsidised with Singapore money, is it not more logical to hire Singaporeans so that the money is invested back to Singaporeans? Instead, the money is now used by foreigners for their career advancement or retirement outside Singapore. This situation is particularly sad as Singaporeans have worked very hard to accumulate this wealth. So why let foreigners enjoy the fruits of Singaporean labour? And to add to the irony, many of the Singaporean ex-professors do not have enough savings for their retirement. They have to make a career switch at the age of 55 – is this not a nightmare? Even though this situation has been going for quite some time, it is not a lost cause. 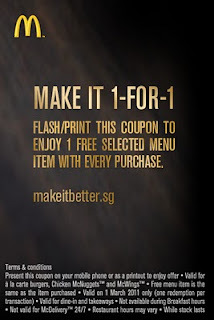 The Singapore government can reverse the situation to demonstrate that they truly place Singaporeans first. Google Operating System blog published an article on fixing the following 7 annoyances on Google Chrome. Microsoft allows you to test drive Office 2010 free for 30 days; after that, you have to get a license and activate. Many didn't know that it is possible to increase the trial period by another 30 days, up to 5 times for a total of 180 days. To extend, open command prompt and go to C:\Program Files\Common Files\Microsoft Shared\OfficeSoftwareProtectionPlatform and run OSPPREARM.exe. If you installed the 32-bit edition of Office on a 64-bit OS, replace Program Files with Program Files (x86). The LifeHacker has an interesting article that talks about security aspects of online tracking by service providers e.g. Google. Motorola's Android powered Xoom tablet hit stores on Thursday, but is now being sued for trademark infringement. The plantiff is California-based Xoom Corp claiming that it has rights to the Xoom name. Xoom Corp., which runs a money-transfer business, registered the xoom.com domain in 2003, and registered the Xoom trademark on December 14, 2004, according to the suit. Motorola filed an "intent-to-use" application of its own on October 26, 2010. Xoom Corp. also says Motorola purchased the Xoom keyword for online searches, so searching "Xoom" on Google puts the official Motorola Xoom tablet Web site at the top of the results. HTC just unveiled ChaCha 'Facebook Phone', which include a dedicated button that takes users directly to Facebook, is sued for trademark infringement for using the name ChaCha. The plantiff is search service ChaCha. ChaCha is a search service that debuted in 2006. Two years later, it expanded to mobile, launching a service that lets people ask questions via voice or text, and receive responses from ChaCha within minutes. It is now possible to hide all or selected labels from subject lines. This can be done by going to Labels tab in Settings. 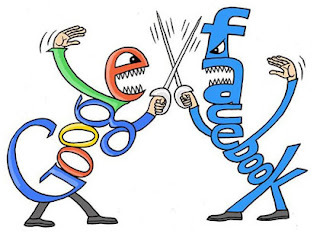 Following the release of a Google Chrome extension Personal Blocklist to facilitate blocking of sites from your search results and send the information back to Google so Google can eventually use submitted results to filter away low quality domains, thus improving search results, Google announced in a blog post that algorithm towards search rankings is updated. In a blog post by the Microsoft, it is confirmed that highly popular smartphone mobile game Angry Birds is coming to Windows Phone 7. When someone attempts to share an article on Facebook, Facebook will pick the "best" image to be used for the thumbnail. Should you wish to change this default behaviour, the following are required. Of course the image path has to match your exact path. Microsoft announced Monday that Facebook chat is now available to Hotmail users worldwide, wherever Facebook has a presence according to a blog post, that's after having brought Facebook Chat available through Messenger a few weeks ago. And while Gmail beat us to bringing their own chat into the inbox, we have now gone a step further and brought both our own chat and Facebook chat into your inbox. Starting now, we will be displaying notifications of this update in Hotmail. Google Cloud Connect for Microsoft Office integrates with Google Docs and provides a bridge for Microsoft Office users who want to use online collaboration features without upgrading to Office 2010. The Singapore Democratic Party will be looking to leverage on the Internet in their campaign for the coming General Election. When contacted, the party's secretary-general Chee Soon Juan said: "We will maximise the use of the social media to help us spread our message. 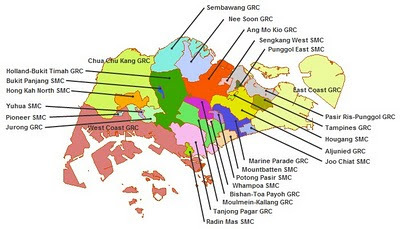 The two GRCs it wants to contest are West Coast and Chua Chu Kang, and the three SMCs are Pioneer, Hong Kah North and Radin Mas. Mrs Lina Chiam, wife of Opposition MP Mr Chiam See Tong said she will stand as a candidate in Potong Pasir SMC. Veteran Mr Chiam may contest in Bishan-Toa Payoh GRC. The Singapore Democratic Alliance (SDA) has expressed interest in contesting the Punggol East, Radin Mas and Mountbatten Single Member Constituencies (SMCs). It will also field a team in the 6-member Pasir Ris-Punggol GRC, said Secretary-General Desmond Lim. For a pictorial view of the newly drawn Singapore Parliamentary Electoral Map 2011, please refer to this link. Prime Minister Lee Hsien Loong has accepted the recommendations of the Electoral Boundaries Review Committee. The details were released on Thursday by Parliament, and is the first step and a clear sign, that Singaporeans will be headed for the polls soon. Going by past elections, from the release of the Boundaries report - which spells out changes to constituencies - to polling day, it can take anywhere between 17 days and nearly six months. Political parties usually map out their election strategies after the Electoral Boundaries Review Committee report is released. That's because, the report recommends the size and the geographical boundaries of each constituency, which will affect the activities of parties trying to woo voters. The committee recommended changes after looking at voter population growth. This time, the committee was tasked to create a minimum of 12 single member wards, more smaller Group Representation Constituencies (GRCs) which put four to six candidates together on one slate. It was also tasked to create fewer large six-member GRCs. Smaller GRCs and more single member wards reduce the perceived hurdles the opposition face, in getting into Parliament. There will now be 12 single member wards up from nine. There are eight new ones including Whampoa, Yuhua, Mountbatten and Radin Mas. The rest are: Hong Kah North, Pioneer, Punggol East and Sengkang West. Some of these Single Member Constituencies (SMCs) were carved out from bigger GRCs. Two existing oppositions wards of Potong Pasir and Hougang remain. The large six-man GRCs have been reduced significantly to just two from five. The two remaining are the Prime Minister's GRC of Ang Mo Kio and Deputy Prime Minister and Defence Minister Teo Chee Hean's GRC of Pasir Ris-Punggol. Pasir Ris-Punggol has 204,845 voters while Ang Mo Kio has 171,080. Minister Mentor Lee Kuan Yew's ward of Tanjong Pagar and Senior Minister Goh Chok Tong's ward of Marine Parade have become five-member wards. Sembawang GRC has also become a five-man GRC from six, while a new five-member GRC called Nee Soon, was carved out from two SMCs. In total, there will be 11 five-member GRCs. More than 2.35 million Singaporeans have registered to vote ahead of the next General Election. The Electoral Boundaries Review Committee said it worked on a range of 20,000 to 36,000 electors per MP. With the changes, the total number of MPs will be 87 - slightly more than the current 84. Before the general election can be called, Parliament has to be dissolved and the writ of election issued. But the budget debate begins on Monday and is expected to last for at least two weeks. Parliament could be dissolved after that, and pundits and politicians have predicted that the polls could take place in May. Dr Gene Sharp is the man credited with the strategy behind the toppling of governments from Serbia to Egypt. For decades now, people living under authoritarian regimes have made a pilgrimage to Gene Sharp for advice. Has his advice helped millions of people around the world achieve their freedom without violence. Microsoft announced Tuesday that Windows 7 Service Pack 1 is now available for download via the Microsoft Download Center. It is also available when you perform a Windows Update. Service Pack 1 offers a ton of bug fixes and security updates for your Windows PC. Benjamin Graham, the godfather of value investing and Warren Buffett's mentor, has a secret formula on value investing. The math of the Graham number is relatively straightforward. Graham believed that the price-to-earnings (P/EPS) ratio should be no more than 15. He also believed that the price-to-book value (P/BVPS) ratio should be no more than 1.5. From that, Graham proposed that -- as a rule of thumb -- the product of the two should not be more than 22.5. In other words, (P/EPS of 15) x (P/BVPS of 1.5) = 22.5. Read more on Graham Number here. An interview with Warren Buffett. Google Docs Viewer has added support for a lot more new file formats. Now, you can now use it to open Microsoft Excel spreadsheets, Microsoft PowerPoint presentations from Office 2007 and Office 2010, Apple Pages files, PostScript documents, Microsoft XPS documents, TrueType fonts, graphics from Adobe Illustrator, Adobe Photoshop, Autodesk AutoCad and SVG files. Google has released a new Chrome extension Personal Blocklist so you can block sites from your search results and send the information back to Google. Domains marked as not useful will be later used to improve search results. Download Personal Blocklist extension from Chrome Web Store now. Twitter has blocked popular UberTwitter, Twidroyd and UberCurrent apps because they are said to have violated Twitter's API Terms of Service. This move was mentioned on Twitter's support post. Today we suspended several applications, including UberTwitter, twidroyd and UberCurrent, which have violated Twitter policies and trademarks in a variety of ways. These violations include, but aren't limited to, a privacy issue with private Direct Messages longer than 140 characters, trademark infringement, and changing the content of users' Tweets in order to make money. Some key links on Singapore Budget 2011. Popular Technology Site - LifeHacker, has put up a series of videos to teach users the basics of Photoshop. Androidify, available free from Android Market, lets you take the little green Android, and turn it into yourself, your friends, your family, anyone! Just like the Android platform is open, the Android robot can now be freely customized. How does eCPM (Effective Cost Per Thousand Impressions) work? The Google Adsense made a blog post with a video to help us understand the concept behind eCPM (Effective Cost Per Thousand Impressions). Effective cost per thousand impressions (eCPM) is the amount of revenue you can expect to earn from AdSense for every 1000 impressions shown on your site. The video created by the Adsense team comes in 2 parts. In the first part of the series, AdSense optimization specialist, Matthew Carpenter Arevalo, will introduce you to the basics of how eCPM is calculated and explain how to analyze the causes behind any changes in your eCPM. Part 2 of the video series will be made available soon. Ministers in Singapore were pleased with the just-announced Budget 2011, but not for the over 2,000 respondents in a public poll conducted by the Straits Times. A poll conducted on the Straits Times on the Singapore Budget 2011. Result: 47 per cent indicated "Definitely not", 23 per cent "Not really", 17 per cent "Somewhat" and 14 per cent "Definitely". Facebook has launched a better Photo Viewer. The new Photo Viewer comes as a popped out light box so you will be able to stay at the page you are in. One obvious improvement of this Photo Viewer is its better image resolution. 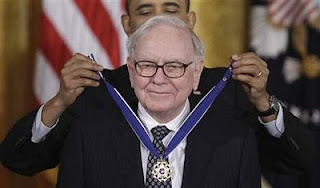 Investing guru Warren Buffett was bestowed the Medal of Freedom by the U.S. President Mr Obama, the nation's highest civilian honour, for his integrity and philanthropic activities. Buffett is “not only one of the world's richest men,” he is “one of the most-respected,” Obama said during the ceremony in the White House East Room. WOW! 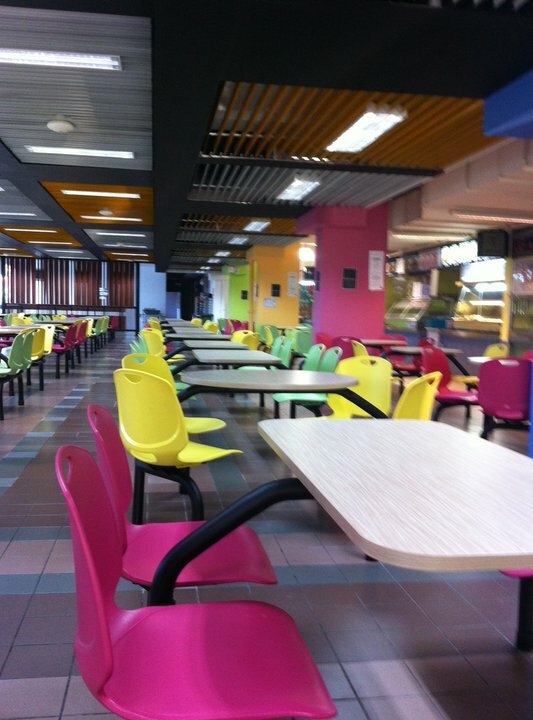 Singapore Polytechnic Food Court 6, located at Business and IT blocks around T20-T22, is now so different. 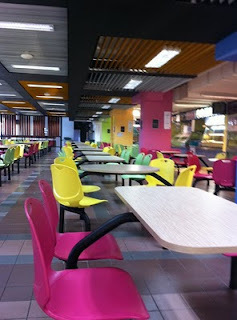 Colourful and cheery. Microsoft has finally decided to turns off AutoRun in its latest Windows Update. With that, it would have prevented potential malicious programs to run automatically when an external device is plugged in. GREAT! Finally after the AutoRun was started since Windows 95. A 40-digit jailbreak code for the Sony Playstation 3 is making the rounds on Twitter after a Sony marketing account accidentally re-tweeted the code posted by a 24-year-old software developer. 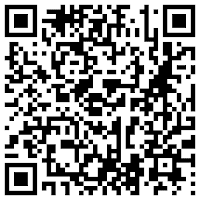 A TwitPic of the code can be found here. Interesting analysis on the performance of mobile apps Shazam and SoundHound. Is Jetstar Asia a majority Singaporean owned flag carrier? Erm .. From what I know previously, Jetstar Asia is owned by Qantas, however, a report published in Australia says otherwise. It mentioned Jetstar Asia is majority owned by a Singaporean. Nokia said Friday that the company will pursue a long-term relationship with Microsoft, and make its Windows Phone 7 operating system the foundation for its mobile phones. In return, Microsoft will integrate Nokia services into its own, such as Nokia Maps with Bing and AdCenter. Microsoft will provide Nokia with developer tools, and Nokia's application and content store will be integrated into the Microsoft Marketplace, the two companies said. In January, Thai airline P.C. Air employed transsexuals as flight attendants. I must say the 4 hired flight attendants do look beautiful. Google on Thursday unveiled a new, two-step Google Account sign-in process intended to provide an extra, optional layer of security. When enabled, users will have to enter their passwords as well as a separate code that will be sent to mobile devices before gaining access to products like Gmail or Google Docs. If you are not seeing the new link now, just wait patiently for the gradual roll-up. Yesterday, Google celebrated the famous Jules Verne’s 20,000 Leagues Under the Sea 183rd birthday by launching an animated doodle for it. The doodle tried to capture that sense of adventure and exploration. Using CSS3 (and with help from our resident tech wizards Marcin Wichary and Kris Hom), the doodle enables anyone to navigate the Nautilus (nearly) 20,000 leagues with the simple pull of a lever. And for those using devices with built-in accelerometers and the latest versions of Google Chrome or Firefox, it’s even simpler—just tilt your device in the direction you want to explore and the Nautilus will follow. If you have missed the doodle, watch the video below or explore the ocean from Google's Jules Verne doodle in full view and HD. Borders Group, the bookstore known to many for its comfortable couches and variety of books and magazines, is likely to file for bankruptcy protection after seeing sales drop and earnings plummet. On Friday, the company disclosed that it no longer complies with New York Stock Exchange rules that require it to maintain a minimum average trading price of US$1 a share over 30 days. At current, Borders is trading at US$0.393 per share. I feel sad for them should they really file for bankruptcy. In the previous biannual treasury reports on currencies, the U.S. Treasury refrained from labeling China a currency manipulator but took a tougher line than in past years, saying the yuan is "substantially undervalued" warning "progress thus far is insufficient and that more rapid progress is needed". Members of Congress and others have urged the Obama administration to brand China a "currency manipulator," which, under U.S. law, would trigger negotiations and possible sanctions. But like his predecessors, Treasury Secretary Timothy F. Geithner has tried to resolve the issue through diplomatic channels - criticizing Chinese policy and urging them to make changes without formally invoking U.S. law. 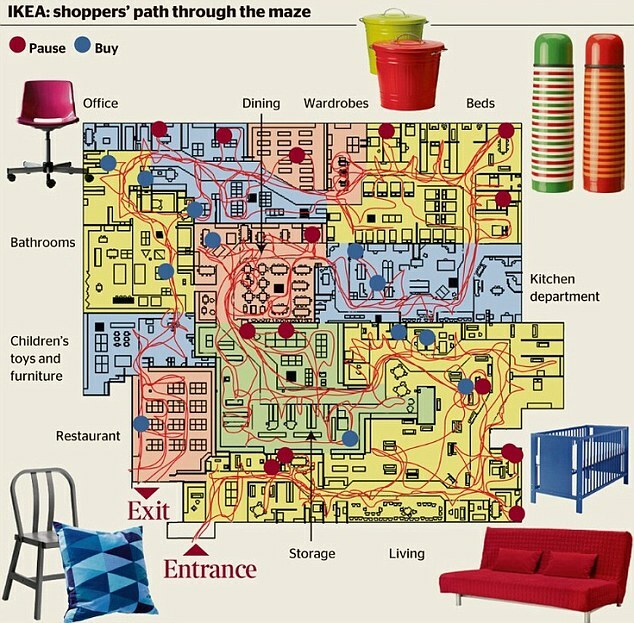 IKEA stores are designed like a MAZE in order to prevent customers from leaving! Why? Q: What thing about humanity surprises you the most? And as a result he doesn't live in the present or the future. Hopefully the new regime in Cairo will respect the peace treat between Egypt and Israel, and not end up forming another Islamic majority together with Iran and the rest against the Jews, thus jeopardizing peace in the Middle East. The blow up of gas supplies to Israel must not be a prelude to an Islamic 'Earthquake' in Middle East. An informative article on the topic of Checklist for the financially sound posted on CPF IM$avvy. CloudMagic, the previously Gmail-only add-on that significantly speeds up searching, has extended its powers to cover your Google Docs and Contacts. Find documents, spreadsheets, and people without the wait for Google to return your results. With CloudMagic 2.0 you can refer to other emails & docs while composing a message without opening different tab or window. Similarly you can refer to any docs or emails while working on docs. There are plans for CloudMagic to provide future support on Twitter, Facebook, Yahoo! Mail, Hotmail, AOL, etc. CloudMagic is a free add-on that works with Chrome and Firefox, on Windows, Mac, and Linux (32-bit and 64-bit). Go to their download link now to get the latest CloudMagic. Few days back, Google claimed that Microsoft Bing copied Google search results. Late last year, Google had run a sting operation that it said proved Bing had been watching what people searched for on Google, selected on the sites from Google’s results, then used that information to improve Bing’s own search listings. However, Bing denied this. Microsoft's Bing Team then hit back at Google over accusations that it stole Google search results for its Bing search engine, accusing Google of engaging in a honeypot attack and going after the Bing because it was worried about its growth. Microsoft reiterated that they do not copy results from any of our competitors. Period. Full stop. For updates on Android OS upgrades for Motorola phones, visit their support page at https://supportforums.motorola.com/community/manager/softwareupgrades. Looks like there will be several pushes for Android 2.2 Froyo in Q1 and Q2 2011. Jess Lee Kar Wei (李佳薇) has made Malaysia proud by winning the seventh season of Taiwan's wildly popular singing competition reality TV show "One Million Star" (also known as "Superstar Avenue" 超級星光大道). has garnered 69 likes so far. Google Chrome has released its latest stable version - 9.0. In it, there are several features and I shall list a few that are worth a try in my opinion. WebGL is a new technology which brings hardware-accelerated 3D graphics to the browser. The chrome team has put up a few demos that illustrate the use of WebGL - among them, Body Browser, WebGL Aquarium and WebGL Music Visualizer catch my attention. 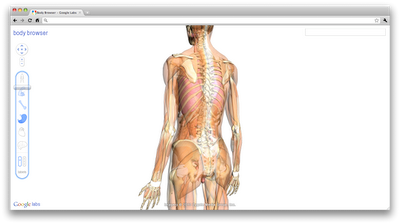 With Chrome Instant (a.k.a. Google Instant), web pages that you frequently visit will begin loading as soon as you start typing the URL. It's disabled by default, so you need to enable it by checking "Enable Instant for faster searching and browsing" in the Options dialog. Cloud Print allows you to print from devices that can't communicate directly with printers. The first two applications that use Cloud Print are the mobile versions of Gmail and Google Docs. Like Instant, it is disabled by default. To enable it, go to Options > Under the hood. The Chrome Web Store is now open to all Chrome users in the United States. Researchers from Italy have discovered the disputed identity of the model for Leonardo da Vinci's Mona Lisa. Silvano Vinceti, chairman of the Italian national committee for cultural heritage, said the Florence-born Renaissance artist's male apprentice and possible lover Salai was the main inspiration for the picture. This is after having found similarities with the Mona Lisa's nose and mouth against earlier portraits, and close examination revealed an L for Leonardo and an S for Salai. However, the claim was immediately disputed by experts at the Louvre in Paris, where the painting is on display. The debate goes on again and again, possibly forever. Finally! Blogger is playing catch up with times by releasing a mobile app for Android. With the app, blogging on-the-go is a possibility. However, Blogger's Android app is really basic and does not offer too many features. Editing of existing post is not possible. The editor offered only lets you enter text and include one or more photos. You can add some labels and geotag your posts, taking advantage of your phone's GPS. There is an option to save a post as a draft, but you won't be able to publish it from a computer because it's only saved locally. If you are already on the new Android marketplace (market.android.com), just click on https://market.android.com/details?id=com.google.android.apps.blogger and then choose install would invoke an automatic installation on your Android phone. 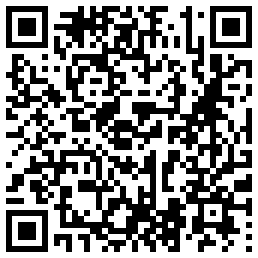 In other words, QR Code is not required anymore (but I shall provide it as below anyway). Microsoft's Bing Team hit back at Google over accusations that it stole Google search results for its Bing search engine, accusing Google of engaging in a honeypot attack and going after the Bing because it was worried about its growth. We do not copy results from any of our competitors. Period. Full stop. Follow this link for the complete reply from the Bing Team. Hotmail new alias feature allows you to use multiple email addresses on one account! The Windows Live Team announced a new feature on Hotmail that allows user to create and manage multiple email aliases from a single Hotmail account. The new aliasing feature makes it easy to use a different email address and still get all the benefits of Hotmail without having to change your primary email address and online identity. Up to five aliases can be added per year to your Hotmail account, up to fifteen aliases in total, all designed to make it a lot easier to organize different types of email and personas in one Hotmail inbox without having to give out your primary email address if you don’t want to. Just simply give out the alias email address to the right group of users. Email aliases let you create completely different email addresses that you can use to receive email into your primary account without anyone knowing what your primary email address is. The Number Resource Organization (NRO), an industry group made up of five regional Internet provider registries, announced on Feb 3 that the free pool of available IPv4 addresses is now fully depleted. It had handed out the last of the available addresses on the old system. The future of the Internet is in IPv6. All Internet stakeholders must now take definitive action to deploy IPv6. The old system, called IPv4, uses a system of numbers, typically separated by decimals, like 192.0.6.148. IPv4 had about 4 billion addresses (32 bits), which ran out more rapidly after mobile devices with Internet connections became commonplace. Now all new Internet addresses will use IPv6, a system that has more numbers and characters, and is said to have enough spots for 340 trillion, trillion, trillion unique IP addresses (128 bits). The two systems aren't automatically compatible with each other, however, so service providers and network operators need to upgrade systems to ensure the transition is smooth, which is why there has been so much recent attention focused on the subject. Visit here for more information on IPv6. Since IPv6 addresses are 128 bits long, the theoretical address space if all addresses were used is 2128 addresses. This number, when expanded out, is 340,282,366,920,938,463,463,374,607,431,768,211,456, which is normally expressed in scientific notation as about 3.4*1038 addresses. That's about 340 trillion, trillion, trillion addresses. Looks like this figure is almost infinite. Shall give it a miss next year. This Lunar New Year, StarHub TV customers are rewarded with a festive bonus of a 5-day FREE viewing of over 130 channels* from 2 Feb 1200hrs till 7 Feb 1200hrs. During this Free Preview period, you can have non-stop unlimited access to a wide range of action, comedy, movies, drama, edutainment and sports programmes simply by tuning in to the respective channels. StarHub Mobile customers with StarHub TV on Mobile supported handsets will also be able to enjoy the Free Preview of all 31 StarHub TV on Mobile channels. Read on here on LifeHacker. Previously, you could only access Android Market directly from your device, but today, Google has unveiled the Android Market website (http://market.android.com/) that lets you browse and search for great apps right from your web browser. You can also send apps directly to your Android device and install them over the air with just a few clicks—no wires needed. And what about all those apps you’ve already purchased and downloaded? Sign in to the website with your Google account and click “My Market Account” to see all the apps you’ve purchased or downloaded. It makes managing all your apps quite easy. Am pretty amazed that Google actually knows the maker of my phone, model and carrier. Islam is growing. But ageing and slowing. That will change the world. According to a research conducted by NetMarketShare, Chrome surpassed 10% share of global browser usage for the first time in January by gaining 0.72% share month to month. Is Microsoft Bing copying Google search results? Danny Sullivan wrote a blog post on Google's claims that Bing copies Google search results. Late last year, Google has run a sting operation that it says proves Bing has been watching what people search for on Google, the sites they select from Google’s results, then uses that information to improve Bing’s own search listings. Bing doesn’t deny this. How to add Facebook Like button on Blogger Blogspot? How do I add Facebook Like button on Blogger Blogspot?